Science Catch-up. Cue To Overeating. Want more science? Sign up for FREE updates! Welcome to our Thursday Science Catch-up: curated links by The Health Sciences Academy. Get our email updates every other Thursday here (it’s free). Let’s catch you up with studies and news that recently made the headlines! 2. Egg yolks or whites for muscle building? 4. Want to become a research pro? So how can we resist temptation? Food cues, such as the design of a restaurant and photos or aromas of food, may up a consumer’s desire to indulge more. In this study, participants were either exposed to an environment with many food cues or neutral (plain) ones. It was discovered that the food-cue rich environment led participants to report a greater desire to eat, more hunger and, as you probably guessed, increased food consumption. 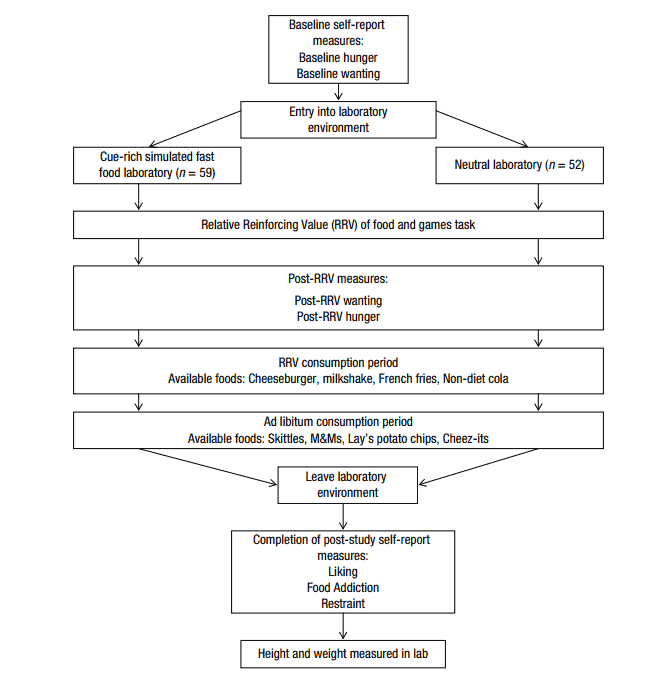 Flowchart illustrating the study procedure (Joyner et al., 2017). However, the pleasure or liking for eating was not increased despite the food cues. Minimising exposure to environments that promote food-cues, like fast-food restaurants, may help individuals to avoid indulging extra calories in the absence of hunger. If you’re someone who wants to help clients with their food cravings, we go a lot deeper into eating psychology and appetite neurochemistry in our Advanced Clinical Weight Loss Practitioner™ Certification. Click here to learn more or download the curriculum. Egg yolks or whites for muscle building? And because eggs are a great source of protein, they are often the go-to food during periods of intensive workouts. But perhaps you’ve noticed how some body builders discard the egg yolks and only eat the whites, in the belief that they are better for optimising muscle repair and growth. For that, healthy young men, who regularly trained and exercised, volunteered for the study. their equivalent amount of protein (18 grams) from just whites. Then, the scientists took samples of blood and muscle from the participants to analyse these dietary effects. Differences in muscle protein synthesis rates when individuals where in a fasted state compared to when individuals consumed egg whites only or whole eggs (van Vliet et al., 2017). 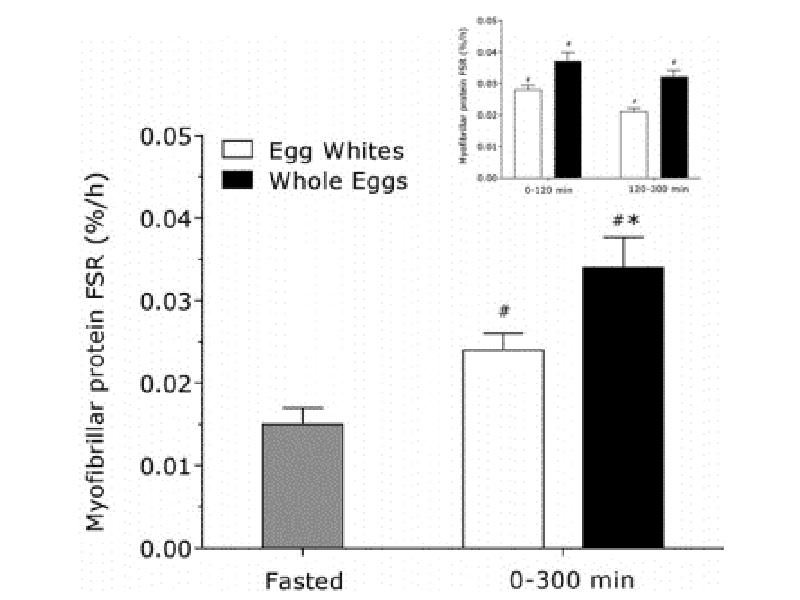 Surprisingly, they found that it was the whole eggs that stimulated greater muscle protein synthesis – i.e. greater muscle growth. They suggested that the nutrient-dense yolk may help optimise this growth. You see, many people think that the yolk is simply fat, while in fact it also contains a lot of protein and fat-soluble vitamins. Although this was only a small trial, it helps us to discard the notion that getting rid of the egg yolk is better for promoting muscle growth and repair. Now, you may be wondering: up to how many egg yolks a day we can eat? We unscramble the latest on egg science here, so when someone asks you this age-old question, you’ll have the most up-to-date answer! And though this may seem inevitable, increased sitting time has been associated with mortality from all causes, including cardiovascular disease and reduced life expectancy. A recent study conducted in office workers examined perceptions of sedentary behaviour on multiple aspects of health. Following the data analysis, it was shown that most participants believed that sedentary behaviour negatively impacted their health. The most commonly reported health complaints included back pain, neck pain, and weight gain. Moreover, the researchers acknowledged that interventions could be implemented to address health problems associated with a sedentary lifestyle. 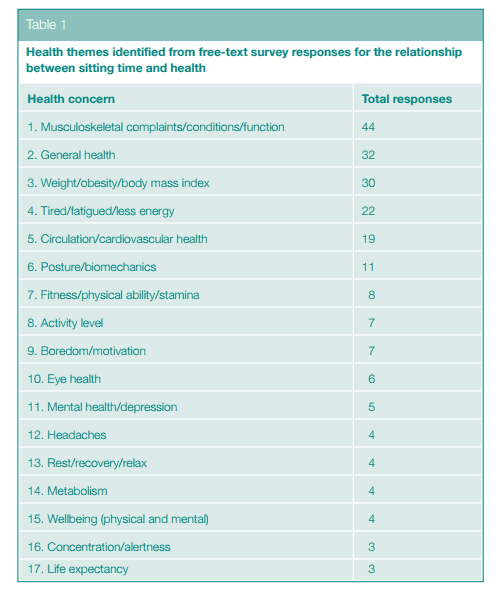 Popular health concerns highlighted by office workers (McGuckin et al., 2017). For example, things like standing in meetings, walking breaks, and computer reminders to move around were all identified as possible changes. Nevertheless, workers noted that support from employers would be vital in making those strategies a reality. So, small, simple changes in our daily work environments could have the potential to improve our overall health. Even better, employees agreed that these changes could also boost their productivity at work! That’s why in our upcoming Stress Management Advisor certification we’ll show you how you can make a dent in this space. Click here to get notified when it goes live (and get something special too). Want to be become a research pro? With so much contradictory advice out there, how are you supposed to convey the right answers — so clients don’t doubt your advice? And we’ll be doing this through a 16-week LIVE mentorship program called BECOME A RESEARCH PRO. Soon we’ll be opening the doors to a few people only, and mentor them in the same way we mentor the scientists and PhDs in our own research team! So you first need to get your special invitation by clicking HERE. But be sure to get there quickly – we’re closing invitations today. And only those who join our VIP list will get PRIORITY access and the chance to receive something special that no one else will be getting! If you want to get the latest science and our tips, make sure you sign up to our Thursday emails HERE.